Next Level Removalss' transparent pricing matched with top of the range service means you can’t afford NOT to move with us! Perfect for a 1 or 2 bedroom move, with low clearance this truck is able to get in and out of tight city access moves where larger trucks might struggle. Bulky enough for a large family or 16-18 staff office. Next Level Removals recommend the option of 3rd men to bring down the total hours of the move. The largest removal truck in the industry, when you need to move your mansion filled with your belongings or your office of 25 staff. It doesn’t get any more superior then this, also recommended by Next Level Removals to take out the option of a 3rd or 4th man. When it comes to office and corporate relocations no other company does it better then Next Level Removals. From upfront pricing and advice to ensuring every item large or small of your office is safely packed, loaded, transported, unpacked and placed in the allocated spot. Call 1300 005 400 now to speak to our office and relocation team now and arrange an onsite inspection for a fixed cost. 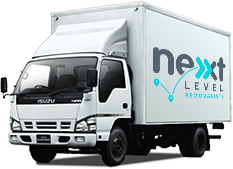 Next level Removalist have an easy to understand open and honest pricing policy. All our removalists costs and rates are published on our website and there are no hidden fees or surprises charges on your removal bill. Next Level Removals promise you will not find a higher level of service for our extremely reasonable and competitive rates. At Next Level Removals our goal is to provide a superior service and this includes making sure that our customers know exactly what the removal costs are and what services they are obtaining for those costs. Part of our Open Pricing Policy is to give you, the customer the choice between an hourly rate or a fixed quote option. Next level Removalist we provide an upfront detailed breakdown of the cost involved in your move. This means that you can expect no last minute fees and charges hiding in the fine print. Next level removalist believes in long term success and to achieve that you must have transparency with clients, especially when it comes to prices. Next level Removals have been around long enough to understand that all moves are not the same, this is why we take pride in tailoring a solution specific to our customers’ needs and requirements. Get in touch with our friendly removalist consultants today on 1300 005 400 and have Next Level Removals tailor your next house move, office move or country move.